Designed for stability and strength, each side is constructed from a single bent piece of heavy-walled 1" steel pipe. Steel shelf supports are welded on, and heavy-duty clamps connect the sides to the top and bottom with three 1" steel pipes between them. Plywood shelves measure 12x32" and 1/2" thick. Comes with 4" caster wheels that completely lock to eliminate swiveling and turning of wheels when you want them to just stay still. Easily assembled by one person. Shipping weight 95 lbs (unassembled). 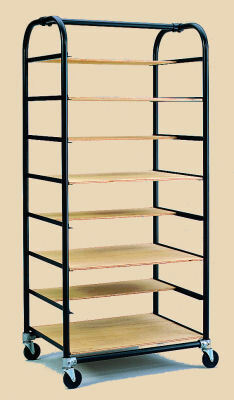 Ware cart and shelves are sold separately, or you can supply your own shelves cut to fit the frame. Laguna's sturdy cart features all-steel construction and 4" hard rubber casters, and offers a full 18-shelf capacity (nine on each side, including top and bottom). 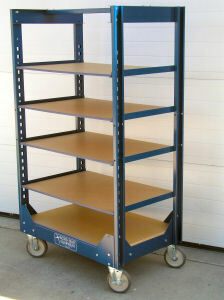 The cart assembles very easily, measures 24x38x58 inches, and can be shipped by UPS (disassembled). Custom sizes are also available. The cart package includes six 12x36x3/4" shelves made of exterior-grade plywood. 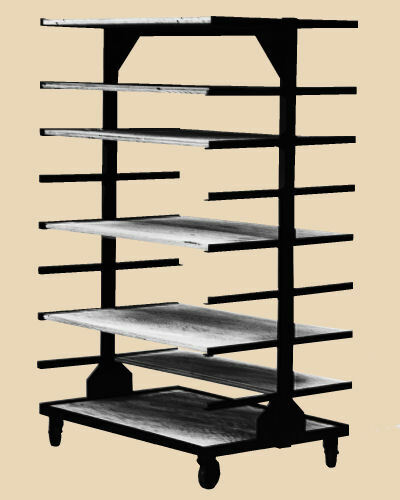 Additional shelves can be purchased separately (see below). Includes ware truck, five plywood shelves and four pairs of standard brackets. Comes with four 6" casters (two with parking brakes), rated to hold up to 1200 pounds on up to 22 shelves (extra brackets available for the extra shelves). Made of heavy powder-coated steel. NorthStar's shelves are 1/2" marine plywood, cut to 24x36" size. Measures 39"w x 24"d x 67"h.
Safe load capacity is 750 pounds.